If you’ve ever broken a bone, had your wisdom teeth removed or took a dose in the emergency room for a significant level of pain, you have most likely taken a prescription opioid. 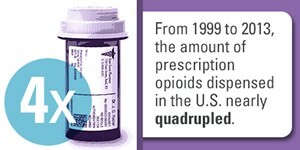 Prescription opioids are a commonly used pain reliever and often standard course for treating pain. 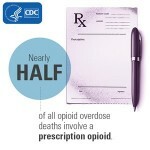 In any given year, close to 2 million Americans are considered to be prescription opioid dependent. For prescription opioids given for non-cancer pain, one in four of those people struggle with addiction and over 1000 patients are treated daily in E.R.s nationwide for misuse of prescription opioids. In 2013, over a quarter of a billion prescriptions for opioids were written by providers. These statistics reflect not only the significance of the prescription opioid problem, but reflect two converging belief systems. Medicine’s belief that opioids are a standard for treating pain and the patient’s belief they should experience a level zero of pain on a scale of one to ten. The standard treatment of a prescribed opioid played out in a commonly occurring fatality in early 2016. In West Virginia, a patient was receiving routine surgery but had a history of opioid addiction and gone through multiple rounds of rehab. This patient was provided an opioid pain reliever upon discharge and overdosed that evening at home. In response to this case, “Jessie’s Law” was put forth as a way to standardize addiction history in medical records. The assumption is that had the discharging provider seen this patient had a history of addiction on the first page of the electronic medical record ( like the way an allergy is noted instead of it being hidden in the back of the patient’s chart) the provider never would have sent the patient home with opioids to begin with. While this is a step in preventing prescription opioid overdoses, it is reactive instead of proactive as a policy. It also addresses only half the story. Four out of five heroin users started their opioid addiction with prescription painkillers. Some patients with addiction issues are overdosing on drugs that are pseudo opioids to try to get that same high. While having standards to providers can avoid accidently prescribing an opioid to an addict, the change shouldn’t be post-addiction. It should be addressing the standard for pain treatment at all levels, that first line of defense to pain, embracing and encouraging alternatives to prescription opioids. Policy changes should be promoting alternatives to pain relief and shifting the culture of medicine: from one of providing opioids for increased patient satisfaction, to educating patients about pain tolerance and non-opioid options to prevent addiction in the first place. This is not saying that when dealing with chronic pain opioids are not effective and necessary, however there alternatives to be considered. Some research has indicated that using alternative methods of pain control, or opioids in conjunction with non-opioid pain relievers and alternative pain management methods, reduces adverse effects related to prescribed opioid use. What is preventing alternative methods of pain management from being researched more thoroughly? There are concerns of access to alternative pain management through palliative care services in the inpatient and outpatient setting. Issues with legality, as medical marijuana is a popular alternative form of pain management. Insurance coverage, because while there are long term costs associated with addiction stemming from opioid addiction, those are often societal costs and do not directly impact the bottom line of the insurance company. Opioids are multi-faceted public policy problem and one aspect of the multifaceted solution is shifting the conversation away from opioids as a standard treatment, to how can we increase education, research and coverage of alternative methods of pain management for chronic and other types of pain treatment not occurring in the inpatient setting. There are ways to promote this conversation, such as exploring the possibilities of Medicaid waivers to see the impact of alternative pain management. Encouraging National Institutes of Health grant funding to further explore alternative pain management to determine impact, effectiveness and best practices. These are all policy solutions that must become part of the conversation. It won’t matter if addiction is clearly visible on a medical record like an allergy if prescribing opioids is still the standard of care. Yes, I should have been clearer. This policy rethink is not to discount the need for effective opioid use for chronic pain. My half sentence recognizing that was not enough emphasis placed on management needs for chronic pain patients. I should have more clearly indicated this is predominantly in regards to non-criminal pain needs. Chronic pain patients are often marginalized on this topic and I should have been better about highlighting that. As a doctoral candidate like the author, also in public policy and administration, and as the spouse of a chronic pain sufferer, I am always distrustful of advocates and researchers who propose changing the treatment regimen for one population based upon the addictive behavior or negative outcomes experienced by another population. Policy solutions that make life more difficult for pain sufferers who legitimately need opioids in order to live anything approaching a normal life are not solutions, they are feel-good policy bandaids. While understanding the need to address the rate of addiction to opioid drugs, I hope that the people who have a genuine need for this type of drug are kept in mind and not hindered nor hampered in their ability to receive this type of medication. More often than not, established users of opioid or pseudo-opioid drugs are given the side-eye about exactly why they’re taking this medicine or made to feel like criminals should they lose a prescription or a problem with a pharmacy arises. This is true even for people with an established medical history of chronic pain/ progressive pain and for whom this class of drugs makes a certain quality of life for those who use them.